Steffanie Rosalez is currently the Director at Cook Arts Center in the Roosevelt Park Neighborhood. She was a participant in the ArtPrize Fellowship of Emerging Curators program in 2016 and curated the Cultura Collective's group exhibits at 912 Grandville and Rumsey Street for ArtPrize 8 and 9. 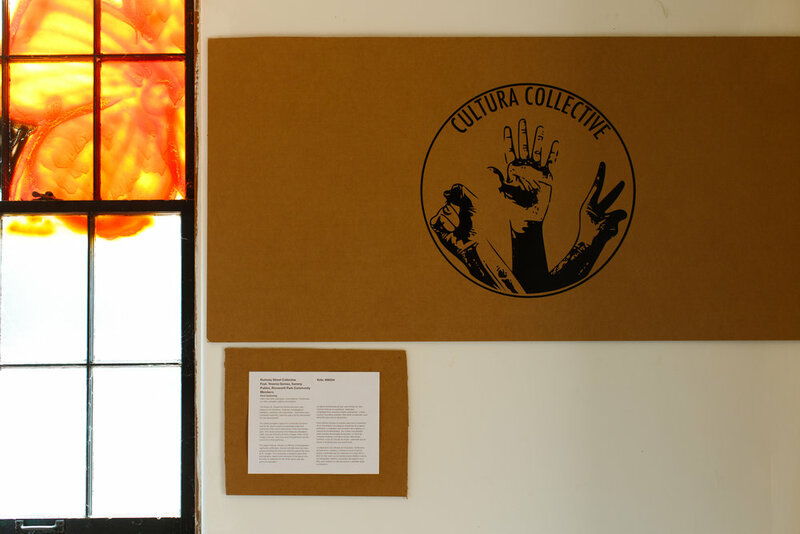 ArtPrize: Can you give a little background of the Cultura Collective? It was initially more about wanting to create public art that was by and for the community itself. There was a long series of things that happened in between then and the time that ArtPrize came to the Roosevelt Park Neighborhood. SiTE:LAB had been here for a year before the Cultura Collective came to be, and that also contributed to that original feeling of, “How come neighbors aren’t represented in SiTE:LAB and in ArtPrize? This is our neighborhood.” So it was really our reclaiming of the space. From the perspective of curator, what were some of the challenges in planning to take over an entire city block and create an experience like you did? There were so many challenges. We did two years of major site specific installations, and both years had different challenges. Initially part of the challenge was trying to navigate how to fit it into ArtPrize’s systems. We kind of had our way of doing things and ArtPrize had their way of doing things and making those things mesh was a big challenge. All of the other challenges came with organizing artists in general. Because everyone was there for the same reason, but everyone’s schedule and needs and vision were very different. Making all of those things work together well to tell a singular story was is the challenge of a curator in general, but particularly challenging because of our lack of resources. Can you talk about the effect that the project had on the community that it was based within? What were some of your expectations before the public showed up and experienced the exhibit? Well, the first year, we didn’t know what to expect. I was overwhelmed with excitement, the way that the community showed up and supported the work was really incredible. More than anything I remember my interactions with many kids going in and out of both spaces. Watching them learning more about contemporary art through a lens that wasn’t white-washed was a huge reason for all of us to be doing it. To show that contemporary art can happen a lot of different ways and tell different stories. It can be by and for a community. Not just for galleries or reasons other than to document and share stories for the community itself. Were there any unexpected discoveries you made in the process of curating the exhibition in either of the years? So many! There were seriously so many things I learned about myself, about my community— how we interact with one another, how we interact with other spaces and ideas. After all was said and done, I think the thing that surprised me most was how so much of the time, especially in community organizing and community arts initiatives, we are always looking for someone else to tell us that what we’ve done is successful and good. I was surprised by not really needing that affirmation by the end. The sense of accomplishment really came from acknowledging each other and working together and telling our own story. Rather than needing people with power and authority in the contemporary art world, or Grand Rapids, or even ArtPrize to say, “yes this is good”— we just knew that it was good. It was good for us whether or not anyone thought it was good. That really surprised me and made me want to talk about that idea more— about who says what is good and how we internalize that as a community. It’s interesting because of course it feels good to be affirmed by anyone. But at the end of the day, if you aren’t being affirmed— do you still feel like you accomplished something or did what you set out to do? And if so, do you feel successful by that? Coincidentally, one of our artists ended up winning and we won a venue award the first year, but really it felt like those awards were more for everyone else and not so much for us. It felt like other people needed someone to tell them yes this was good. But we already knew it was. It was like you were waiting for everyone else to catch up, while you were saying, yes we’ve been here doing this work all along. Yes! And we’ve always known that this work was good for us and our community. And it could be good for you too if you decide you want to participate and appreciate the power and the beauty that exists here. Do you have any memories or stories that really stick out that moved you? So many! I have hundreds— but a couple that stand out to me. One of them was a time when I was alone during the year we were on Rumsey Street. People had been coming and going from the church where we had set up a bunch of videos of people sharing their memories and stories and interactions with the space. For whatever reason that particular day, there were a lot of people who visited who had no idea what was happening there, they weren’t people from the community or maybe not even from Grand Rapids. I had told the story over and over and over by this point. It was the end of the day and I was just sitting there thinking about how many times I had told this story. When I went inside and just sat and watched the videos myself, I had this moment of realizing that if we hadn’t done the project, all of these stories would have been lost. Throughout history, stories like ours go undocumented—that was the title of the show. I have this memory of knowing that we are starting a precedence with this project to remind people to document their stories and to have that be a new layer of American history. That was a memory that’s very important to me. There were a lot of those moments where I was speaking with kids and then speaking directly with GRPS administrators and talking about that issue of whether or not these kids would be able to attend this new high school. I realized those moment lead to greater change, because GRPS became a lot more open in the ways they were planning on doing enrollment in the school. In those moments of interacting with the kids, I remember realizing that there’s potential for this to go really well and there’s potential for this to still be a huge barrier for these kids who got baptized in this very church. Just connecting those dots where these are literally the kids whose lives are being affected by this and how little power they have over anything that happens in their lives and recognizing my own responsibility to them in those moments. It sounds like all of those ideas were put right on the table through such a public art experience. And maybe the space to have those conversations out in the open would have been more difficult to find had it not been for the Collective existing so publically in the neighborhood. Exactly. And then there’s a lot of adorable memories too. I remember one of the dance groups was performing and I was standing in the crowd watching. There was a kid standing next to me and I noticed he’d been there every day. He told me, “I live across the street and I love to dance so I’ve been watching them dance. I just want to dance with them!” So I told him, “Go dance with them! !” He was in disbelief and got so excited and went up there and started dancing even though he didn’t fully know the moves. It was such a moment of joy for him to realize “I can do this too!” He was just a kid who lived across the street who took advantage of having an opportunity to have an audience watching him. I knew that was the reason we were here.